That’s precisely why I will imagine it. Shake them, shake the books, shake the siddur, prayerbook, shake the Tanakh, the Bible, shake them vigorously until the word is shaken loose, Yerushalayim, Jerusalem, Jerusalem, Yerushalayim. Titgadal v’titkadash b’toch Yerushalyim irkha: May You be exalted and sanctified in Jerusalem. Having arrived at the heart of our Sabbath morning service, we stand, we sing. Without Jerusalem, to where would we wish her, the Divine, to return? Within which city would we entreat Her to arise, exalted? Which city would be sanctified by her Residence? Detroit? New Rochelle? Asheville? Where my children and their children dwell, may You be exalted and sanctified there. We move on to the heart of the heart of Sabbath morning prayers: the Torah service. Preparing to open the ark holding the holy scrolls, we sing, Av ha-rahamim, heitivah virtzon’kha et Zion, tivneh homot Yerushalayim: Compassionate creator, may it be your will that Zion flourish; build the walls of Jerusalem. Jerusalem: it occupies our heart. But it’s fraught with conflict; it’s caught in the throat, a bone of devotion-betrayal, poverty-wealth. We call upon the Divine to rebuild and flourish here, inside our heart. What if it were to depart, Jerusalem of the heart, or simply to vanish into the air? Einstein knows, Einstein helped us see: space, even the space of an empty heart, is not nothing. It’s a gravitational field. Even the abandoned heart bends the orbit of our longing around it and sparks our fantasy of Jerusalem flourishing there, its famous four quarters the chambers of our heart: righteousness, compassion, fierceness, love. Each in its place. We sing Ki mi-tzion, teitzei torah, u’dvar Adonai, mirushalayim: For from Zion comes forth Torah, and the Word of God (read: Torah) from Jerusalem. In a moment, one congregant, honored with carrying the Torah, will descend from the ark, and, with the Torah cradled in her arms, will process with it around the synagogue. Every few feet she’ll stop to give the congregants, bunched together at the end of the pews, a chance to touch the scroll with tzitzit, stringed fringes dangling from the corner of a tallit, prayer shawl, or the spine of a siddur, then bring the tzitzit or book to her lips for a kiss. Its long journey to us: through space (from Jerusalem to, in my case, Asheville, North Carolina) and time (millennia). The past, the ancient past, joins us in the present. The distant city joins us right here on Murdock Avenue, Congregation Beth Israel. 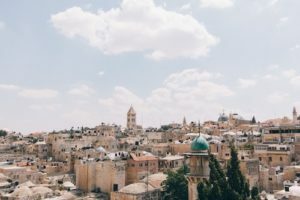 Without Jerusalem, would we be detached from history and eternity, unbound from space and time? Unstoried, would we be liberated, free to receive the enclothed scroll, when it reaches our pew, as merely an object of interest, no longer entombed in myth, wrapped in the words of rabbis throughout the centuries whose interpretations obscure the simple thing at hand? What’s the story of this scroll in particular? Who is its scribe? How pungent was his smell as he bent to his holy task? In what dim light did he—though there are a few scrolls floating around written by a she, it’s unlikely that this scroll in particular is one of those—work as prescribed to draw each and every letter, crowned in glory, just right? What if we no longer were called upon to trace its origins all the way back to Jerusalem and were instead free to celebrate its local story, its journey, say, from Crown Heights, Brooklyn to western North Carolina? Would we feel less burdened by the unmythed thing? Or would we feel lost? Processing around the perimeter of the sanctuary, Torah inscribes an “O” or a “0”. Oh. Zero. From within its negative space, from nowhere, we offer our prayers. No one ourselves, we address our longing for ______ to ______. No one: no memory of home, no dream of return, no Diaspora, no Jerusalem. No two. No one. But I have escaped it, I have razed it, I have erased it. Yet, if instrumental music were permitted, if there were a guitar in this sanctuary, I’m certain I could pick it up, strap it on, and, my right hand strong (no wither), a pick held by nimble fingers, I would pluck the strings and strum and sing (no cleave): Dylan, Cohen, Beatles, and Stones: songs of my youth, my first psalms, my first prayers. My congregation? My, my, my, my, my generation. Once there was was a city, Jerusalem. Its coordinates: 31.7683° N, 35.2137° E. Now there is no city, ancient and modern, divided and united, in glory and ruins, secular and black. No Jerusalem, not for Jews, not for Christians, not for Arabs. And no Jerusalem for me. No longer in my blood, no longer just beyond the range of my seeing from Appalachia’s Mt. Pisgah: Jerusalem. But if there is no Jerusalem, what becomes of the last four decades of my life? Vanished, gone, never were. Who would I be then? For it was in Jerusalem, in the late seventies that the walls of my unique, special, privileged, assimilated, middle-class American Jewish life came tumbling down. Walking the streets of West Jerusalem, I was the moment at which history had arrived. History, God’s creation, was me and every other Jew in Jerusalem—Iraqi, Yemenite, Moroccan, Russian, Argentine, Syrian, British, South African, French, Greek, American—on the street, the bus, in the supermarket, the study hall, the medical clinic. Jerusalem erased a self, my self, and transformed it into a people. Jews without Jerusalem? Possible to imagine. Impossible to survive.